I lived most of my childhood in my imagination. One could say that about most kids. But there seems to come a point very early on with most kids where they realize that the boys should be playing the sport du jour during recess and the girls should be giggling and talking and whatever else they do. Call me stereotypical, call me sexist, but think back to what most boys and girls on your elementary school playground were doing on a typical day. Yeah, that's what I thought. Whether this is by nature or nurture, it's what tends to happen. I was not athletically gifted. I'm still not. I learned to play various sports growing up, but learning how to play them, loving the idea of them, and being good at them are very different. I knew how to play, but I was better off staying away from the field or court. Eventually, I occupied a good amount of time by learning to play the drums. By high school, I was both a band and drama geek. It's what I was good at; what I was dedicated to. I turned out to be one of the artsy kids, and was energized much more by music and theatre than by sports. Creating something in those areas held much greater appeal for me; it's where I found my niche. Before I picked up a pair of drumstricks and before I stepped out onto a stage, I had a love for drawing. In elementary school, of course, I wasn't much of an artist, but it didn't stop me. I developed an eye for certain things, mostly a cartoony style that nevertheless got the point across. In other words, what a typical 8-year-old might come up with. It wasn't before too long that I gravitated to more of the superhero genre. It's important to note here that I wasn't a big comic book person. But I liked coming up with my own. I drew warriors of all kinds: robots, monsters, humans armed to the hilt, wizards, geniuses of both the good and evil variety. I filled notebooks with these characters, proud of the pile of them growing on my bedroom floor. This was my non-athletic outlet; this was my entrance into all those other creative activities. I was not alone in this imaginary world. My father's side of the family all lives in New Jersey. That's where he grew up, and where they still call home. It was my grandparents in northern Jersey, just a 20-30 minute drive into New York City. My father's sister's family lives further south. Trips out east to see this side of the family weren't as frequent as trips to Michigan to see my mother's side due to simple distance, but that just made these trips extra special. 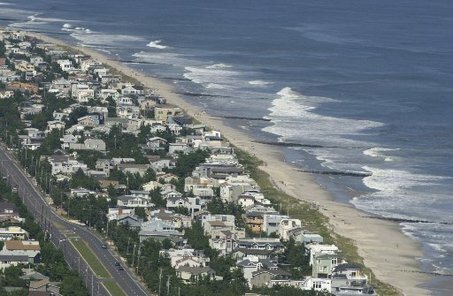 At some point when I was very young, that entire side of the family began going in together to rent a beach house on Long Beach Island every summer. There were certain vacation-related activities that I knew to look forward to every year, but this was one of the big ones. Nearly every year, the house would be as close to the beach as one could get without it being built directly on the sand. We had a great view of the ocean, and would spend nearly the entire day on the sand or in the water. My cousin, not even a year younger than me, perhaps looked forward to these trips as much as I did. I have a brother six years younger than me, but for a time while I was growing up, Gavin was my other brother who'd been kidnapped and forced to live on the east coast. We ran around together like brothers, and we sometimes fought like brothers. During those beach summers, we wandered the beach and other parts of LBI like it was ours: our week, our vacation, our time. At some point, the adults got together and decided that my time with my cousin could be expanded. Not only would we get together during this week at the beach, but maybe we could start spending 6-8 weeks of the summer together at our grandparents' house. And so it was. We did all the typical things you'd expect two prepubescent boys to do: we rode our bikes all around town, we explored the neighborhoods around us, we watched girls walking or running the high school track, we camped out in the yard, we played video games, and we lived through our imaginations. We drew characters; we created entire worlds of good and evil complete with backstories. Our notebooks piled up. The summer sun and cool shade of the trees of suburban New Jersey was our physical setting, but we barely noticed. It was the setting of our minds that set the agenda for our days. Summers in New Jersey defined the rest of my year. When my cousin and I weren't together at our grandparents', we were writing letters back and forth to update each other on happenings, show off our latest drawings, talk music, and plan for our next time together. I lived for summer: it could be the dead cold of January, and I'd be planning for sunny times in Tenafly. For various reasons, the time at my grandparents' began to wane. I recall one year as we'd gotten older when we were together for only two weeks. By that point, my brother had joined in on the fun. The trip to Long Beach Island hadn't happened in a few years by that point. Drawing slowly gave way to music and Magic: The Gathering (and in the early, naive years of becoming serious about my Christian faith, the Magic cards disappeared as well). The time got shorter and shorter, and I realized that this special summer time was passing away. Before I graduated high school, I made my wishes known for a graduation present: I wanted one more week at Long Beach Island with the whole family. By that point it had been quite a while since I'd seen those beaches; the familiar sights and sounds of our beloved vacation spot. I was thankful that we were able to make it happen. Things are far different now. My cousin and I still keep in touch, and we mostly talk music nowadays. My notebooks full of characters were inadvertent victims of a bout of spring cleaning a while back. In the past three years, both my grandparents have passed away. It remains that these New Jersey summers in a sense were my childhood. They symbolized the world of imagination in which I lived and laid the foundation for many of the interests I love today. One day we may return to LBI, and Coffeeson can play on the same sand that I held so dear for so long. For now, I occasionally retreat into my imagination to live out those times again.